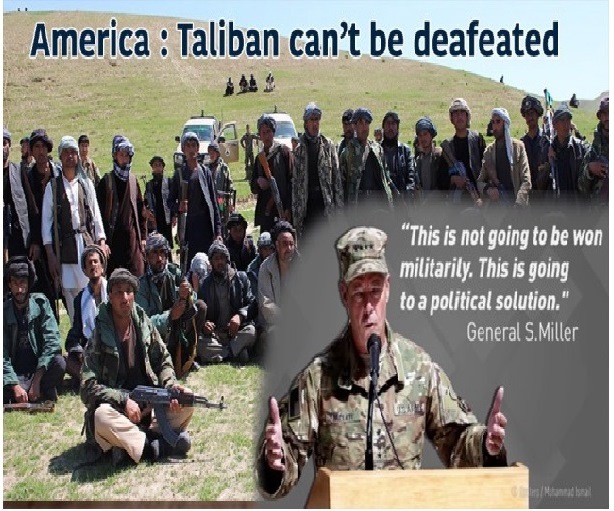 America it seems is begging for an exit, the Taliban however appear to have rejected any offer for a negotiated departure of the occupying NATO forces. As of now the withdrawal looks increasingly calamitous for the invaders as the defending Guerrilla fighters of Taliban have almost destroyed the proxy Afghan national army ( Indian trained ) and its leadership. NATO along with the puppet American government in Kabul hardly control a district, the safest ( so to say ) green zone is being devastatingly attacked by suicide bombers and rocket launchers giving its occupants sleepless nights. The freedom fighters are busy at work. Despite 17 years of incessant bombing of Afghanistan by the world’s most hi-tech military and air forces the moral of these mountain warriors remains intact. The daring raids of the Mujahideen have never lost their vigour and intensity and despite some initial retractions most of the Afghan mainland remains under the control of these students of Madrassas( The Taliban).The Afghanistan theatre of western war has become a desperate issue for Trump and his approval ratings. Afghan warriors on the other hand are luxuriating in the thoughts of vengeance on America, NATO and all those who have helped the invaders, India under Modi has been one of them. The televised grand reception of Taliban’s foes and successive puppet presidents of Afghanistan Hamid Karzai and Ashraf Ghani by PM Modi and his communal cabinet has won India an enemy next door for no strategic reason. America will sink in Afghanistan like every other empire did but what will become of India after that ? Why did Modi join the American war in Afghanistan ? Is it because America had invaded a poor Muslim country, slaughtered its Muslim people , destroyed its crops, imposed a hated ruler on them and that being poor and scantily armed the defending Taliban looked vulnerable and weak? Modi’s perception of Muslim resistance power was based on his experience with the domitable Gujrati slum dwellers of Naroda Patia who his weapon wielded mob could irresistibly massacre in 72 hours of pogrom. Narendra Modi wanted to be the PM of India. The blood bath of innocent Gujarati Muslims gave him the required opportunity to polarise Indian society and he succeeded in ascending the throne in 2014. Modi is an ambitious man, he wants to be a world leader now. By joining an illegal American war on a poor Muslim country, he thought, along with appeasing his hate army of Hindutva would bring him on the table with the western world whose economy is based on war and bloodbath. The Kabuliwalas are shocked at the sudden deadly swing of a friendly neighbour called India. They don’t know Indians are still friends to them. What if the Taliban came to power in Afghanistan again ? Indian embassy bombed in Kabul, Indian consulate attacked in Jalalabad, Indian engineers kidnapped and murdered in Afghanistan., shows the grudge the Afghan Taliban harbour with respect to the Hindutva rulers and their hostile policies in India. Plus the high handedness of Modi in dealing with the Muslim state of Kashmir and the equal mistreatment of marginalised Muslim across the length and breadth of India is also not forgotten by them. India’s open support to the crusading NATO forces both in intelligence and logistics has left them extremely embittered. With the Taliban rapidly gaining territory and influence in Afghanistan and NATO facing an inevitable defeat, the chances of India being squeezed in the Afghanistan nut crackers are getting bigger by the day. Although Modi had found interfering in Taliban’s Afghanistan as an easy means to appease his Hindutva vote-bank projecting it as a dharm-yudh (holy war) . However his burning obsession to defeat and destroy Muslims everywhere may cost our motherland India.Not to forget the nuclear armed Chinese and Pakistani enemies if they chose to supply the Taliban with lethal weapons. PM Modi through his hate policies has certainly pushed India onto a dangerous cliff. Is Doval’s hawkish policy going to face a disaster in Afghanistan ? Is India risking to create another Pakistan in Afghanistan ? These are the question the sooner Indian policy makers address the better.